Transcutaneous Electrical Nerve Stimulator - T.E.N.S. A TENS Units is a small electrical device that delivers electrical impulses across the skin. Transcutaneous (through the skin) electrical nerve stimulation sends an electrical current to specific nerves. The current may be delivered intermittently. The mild electrical current blocks pain signals to the brain and generates heat that serves to relieve stiffness, improve mobility, and relieve pain. The treatment is believed to stimulate the body's production of endorphins or natural pain killers. 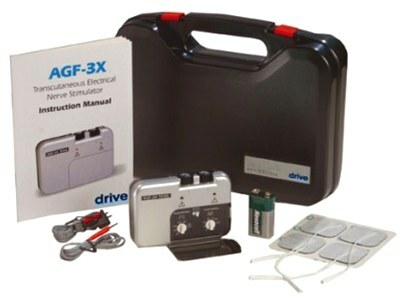 The Deluxe Dual Channel AGF-3X is on sale for $49.95 - complete kit includes everything you need. Dual Channel TENS Units have 2 sets of lead-wires and electrodes. Each channel has it's own controls for pulse width and frequency. Pulse intensity (amplitude) is also adjustable on a channel basis. In most cases, studies show that it takes roughly 30 minutes for TENS treatment to begin to relieve pain. However, for conventional, high frequency TENS treatment, there is no set treatment limit. Some patients find hours of pain relief from short 30-to-60 minute sessions. Others use their TENS units for several hours a day or all day, depending on the pain generated by daily activities. Choose the sliding bath bench that works best for your situation. Available in several rail lengths, the Eagle brand Sliding Benches are both functional and comfortable. Choose from molded plastic or padded seats and backs. Swivel seats available on most styles. Height adjustable legs insure a custom fit for your bath tub. Benches can be reversed from right to left hand tub. Available with commode seat (with cutout) or solid seat.